Brushing, or grooming, your horse serves several practical functions. Removing accumulations of mud and dirt keeps your horse’s skin and hair healthy and protects your riding gear, and allows you to inspect your horse for insect bites and abrasions. 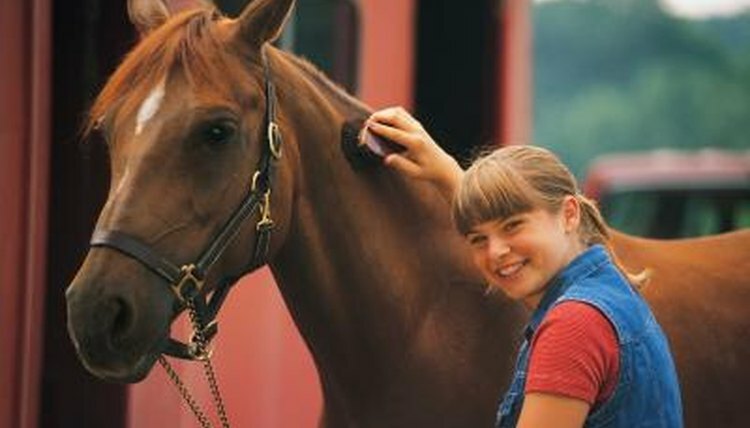 Most horses learn that being brushed is an acceptable activity, indicating they trust humans. Some brushing activity mimics a natural equine behavior that can induce your horse to relax -- and thus affect his heart rate. Allogrooming occurs when individuals within a species group groom one another. If you’ve ever brushed a friend’s hair, you are among many in the primate order that perform allogrooming. Several species participate in this ritual that not only reduces stress, but is also hygienic and demonstrates respect for more dominant species members. Horses do this grooming with their teeth, scratching and picking on the necks and withers -- the lowest part of the neck near the back that is a large nerve center -- of their companions. In 1993, French researchers Claudia Feh and Jeanne de Mazières were able to record a reduced heart rate in horses that received “imitation” grooming in the withers. They also performed the simulated grooming in the horses’ shoulders, but there was no corresponding heart rate reduction. A decade later, a research team at Ghent University in Belgium replicated the study. Rather than use a stethoscope and manual counting as was done in the French study, they adhered electrodes to the horses that automatically measured and transmitted heart rate changes. Their efforts demonstrated that grooming in the hips and shoulders also relaxed horses, although the effect was still greater in the neck and withers area. You don’t have to scratch your horse vociferously with your fingers to try to lower his heart rate -- use a brush with firm bristles and rubber ones with “teeth.” Make the first pass across your horse’s body with the rubber one -- typically called a curry -- to remove mud and dirt. If your horse has thin or sensitive skin, he may move away. Don’t force it on him; try it lightly in the withers area to see if that relaxes him before trying other areas of his body. Once you remove the dirt, flick away the residue with a firm-bristled “dandy” brush, using short, quick strokes. Finally, use a soft bristled-brush to smooth his hair down. Your horse may relax when you use this soft brush across his face, too. Despite research findings about the relaxing effects of brushing, not all horses are convinced. Some are just naturally thin-skinned and don’t like tactile interactions. If that describes your equine and he has no intentions of changing, the best you can do is ensure he has good ground manners so he stands still while you do no more brushing than necessary for his health. Young horses have to learn to accept brushing, and other horses may simply lack training or may have had bad past experiences. With patience, most learn to accept and enjoy being brushed. Give your horse treats or food when brushing so he associates it with something rewarding and pleasurable. Ghent University, Department of Animal Nutrition, Genetics, Production and Ethology, Havenmeyer Foundation. Heart Rate Reduction by Grooming in Horses (Equus caballus). Normando S, Haverbeke A, Meers L, Ӧdberg FO, Ibañez Talegón M.
Animal Behavior Associates. The Positive Effects of Grooming. Daniel Estep, Ph.D. and Suzanne Hetts, Ph.D.
Equiculture: What is Essential Grooming for Horses?